Figure 1. Bearish Belt Hold pattern. 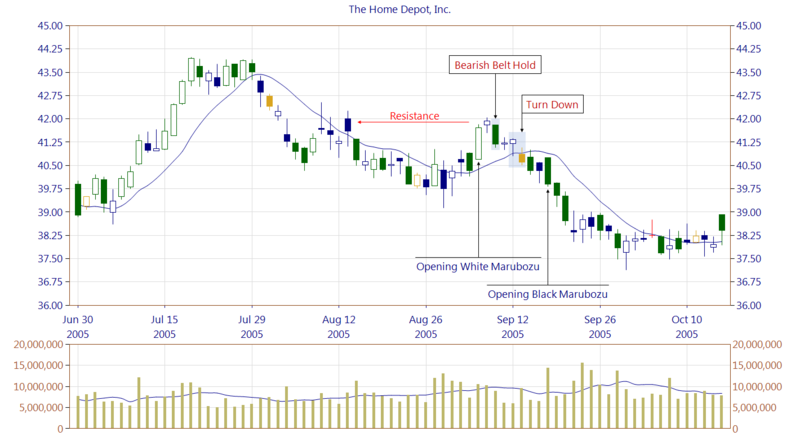 This article is devoted to the Bearish Belt Hold one-line pattern. 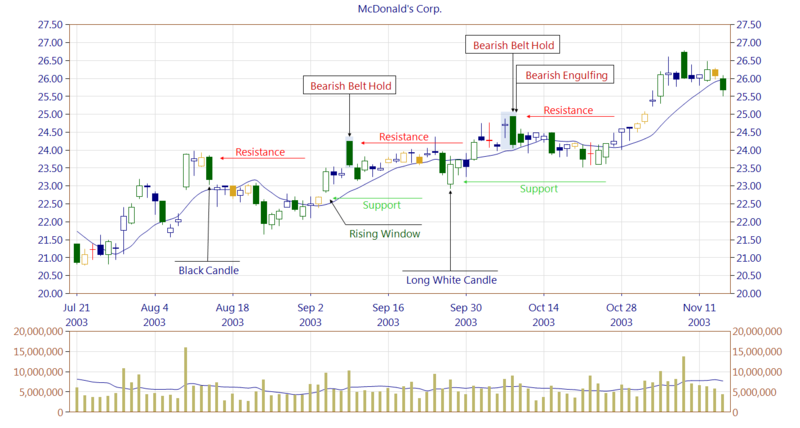 Bearish Belt Hold is a one-line pattern formed by the Opening Black Marubozu basic candle. There is no source providing the information on how short the lower shadow should be. 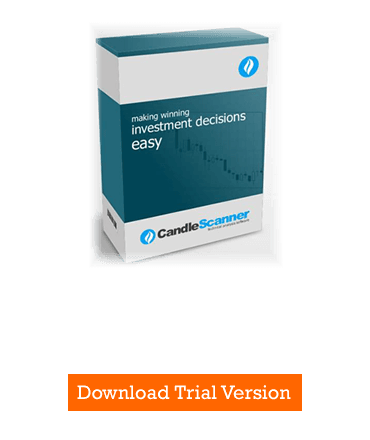 In CandleScanner, we adopted that it should be no more than 25 percent of the candle. The pattern has to occur in an uptrend. Bearish Belt Hold pattern may occur in combination with another pattern. For example, it can be the second line of such patterns as Bearish Engulfing, Dark Cloud Cover, and Three Inside Down. In this case, the more important is the pattern composed of multiple lines. When the Bearish Belt Hold pattern is formed by a very long candle (three times longer than an average length of n last candles), it may create a very strong resistance zone. Figure 2. Before the occurrence of Bearish Belt Hold pattern, the market is trying to stop the downtrend by forming the Opening White Marubozu candle that creates the local support zone. On the chart, you can notice resistance area, within which the Bearish Belt Hold is formed preventing market from further growth. In order to continue the growth, the market would have to close above the Bearish Belt Hold pattern in the following days. Each scenario is still possible as shown by the next two days after Bearish Belt Hold occurrence. On the third day, the Turn Down pattern is created, which beat the local support formed by the Opening White Marubozu. The market is decreasing and the move is confirmed by the Opening Black Marubozu formed at a high trading volume. Figure 3. The occurrence of Rising Window pattern is an attempt to attack the resistance line formed by the Black Candle in August. Rising Window pattern creates a support zone, which as it turns out later, will play a significant role in the near future. The mentioned resistance cannot be successfully broken, and yet another new resistance area is formed by the occurrence of Bearish Belt Hold pattern. It is worth to emphasize that pattern is created by a high trading volume what suggests its strength. Nevertheless, it turns out that the support zone formed by the Rising Window is working well, changing the market trend into sideways. The Long White Candle appearance (high trading volume) confirms the previous support zone pushing it even higher. Then market increases breaking the first resistance area. During the attack on the second resistance line, there is the next occurrence of Bearish Belt Hold pattern being the second line of Bearish Engulfing pattern. The high trading volume that accompanies these patterns shows the determination of the bears. However, in the following days they got weaker and the market defended itself against the declines thanks to the second support zone (Long White Candle). Two occurrences of the Bearish Belt Hold pattern could not change the market trend for good, but evidently stopped its growth for a long time. After the first occurrence of Bearish Belt Hold pattern, the market was in consolidation for two weeks. The second instance resulted in a even longer consolidation, which lasted for three weeks. Below you can find some Bearish Belt Hold pattern statistics calculated by CandleScanner software. To see more detailed statistics, for other markets and periodicity try our CandleScanner software. Prices start at only $10, and you can see more detailed statistics, for other markets and periodicity. Click here to find out more!